On the 11th July 2017, England and West Ham legend Sir Trevor Brooking hosted his annual Celebrity Classic golf day at The Oxfordshire Golf Club in Thame; with thanks to the sponsors, Talk Talk Business. Sir Trevor Brooking made 636 club appearances scoring 103 goals for West Ham during his 17 years as a player including winning the FA Cup winner twice. He later managed the Hammers and has a stand at Upton Park named after him. He was capped 47 times for England also served as the Director of Development for the FA before retiring in 2014. ‍The event, like every year, was raising money for Sparks Charity who fund pioneering children’s medical research. Paediatric research is severely underfunded, receiving only five per cent of public and charitable research funding in the UK each year. 1 in 30 children in the UK are born every day with a condition that may affect them for life. Sparks supports clinicians and scientists who have the skills, innovation and passion to improve children’s lives forever. The day started early with the sun was shining at The Oxfordshire Golf Club, which is perfectly positioned in the rolling hills of the Chilterns. Located on the outskirts of the historical university town of Oxford, it has been home to prestigious events on the European Tour, Seniors Tour and Ladies European Tour. Alongside Sir Trevor were some other famous faces; with each celebrity being a captain of a team of 3. 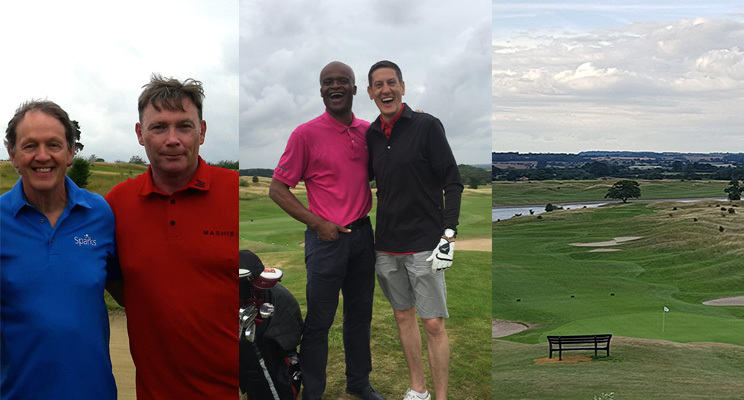 Sam Diamond and Neil Barrall, two directors at Telecoms World, were joined by Kriss Akabusi MBE and British actor Kevin Whately as their team captains. The teams played 18 holes and were competing for the chance to win some of the many top prizes. After a tough day on the course, the evening began with a sit down dinner followed by celebrity entertainment, a live auction and prize giving.